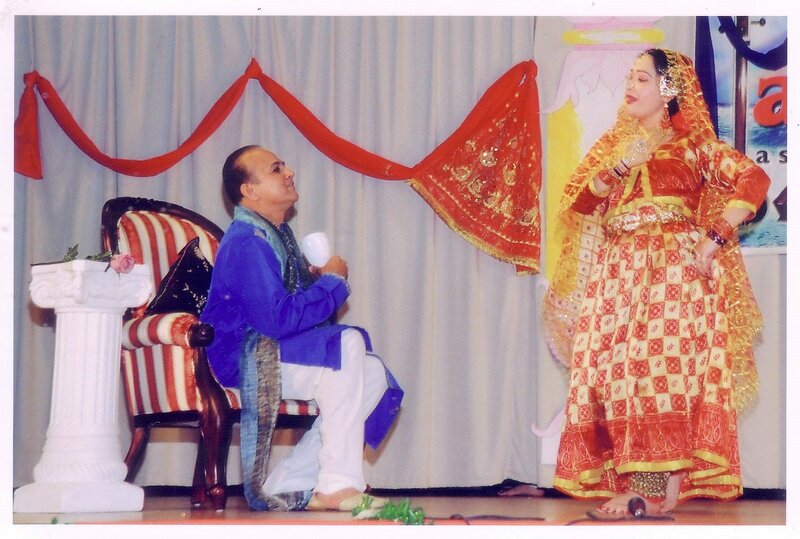 5th Winter Concert of Asavari on Sat Nov 7, 2009 featuring Hindustani Classical Vocal and Kathak was superb. 1. Sat Oct 3 - 8:30/9 pm - Ghazals and Qawali based dances by Gargi and group at Sterling , LI. Kathak performance on Sun Nov 2, '08 at Tuckahoe Library. Kathak performance at www.ecdpa.org on Sun evenig Oct 12, '08... and Kathak performance at the South Street Sea Port, NYC on Sun aftrenoon Oct 5, '08... hosted by Sony TV were great hits. 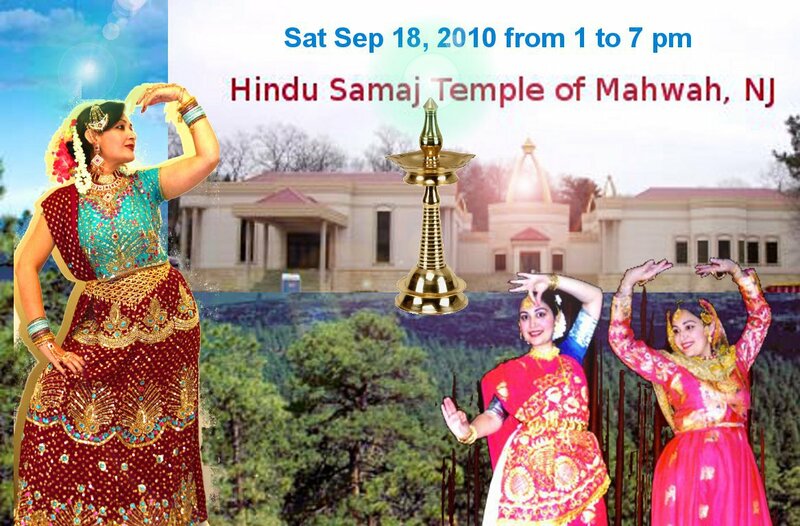 Succesful Kathak performance on Sun Sep 14, '08... in Haverstraw, NY. Sat June 7, 2008 - Spring Concert from 5:30 to 9:30 pm (house concert - invitation only) was successful..
3rd Winter Concert - Sat Nov 17, 2007 at 6 pm which included Vocal, Kathak and Hindi poetry; introducing the participants of the dance drama "Dr. Q?" followed by dinner at Yorktown Heights, NY (invitation only), was very successful. Asavari's 10th Annual Concert featuring Hindustani Classical Vocal, Sitar, and a dance drama "Shayer Niyaz Ki Mohabbat" based on Kathak was very successful. It is a love story based on Lucknow and Lahore. DVD of the concert is now ready to be ordered... also, please view some of the photographs of the concert as posted below. Asavari's concert on Sun Aug 5 (early evening, outdoor event) at Heritage Fair, organized by IACAW was very successful where Asavari has showcased Kathak dances. 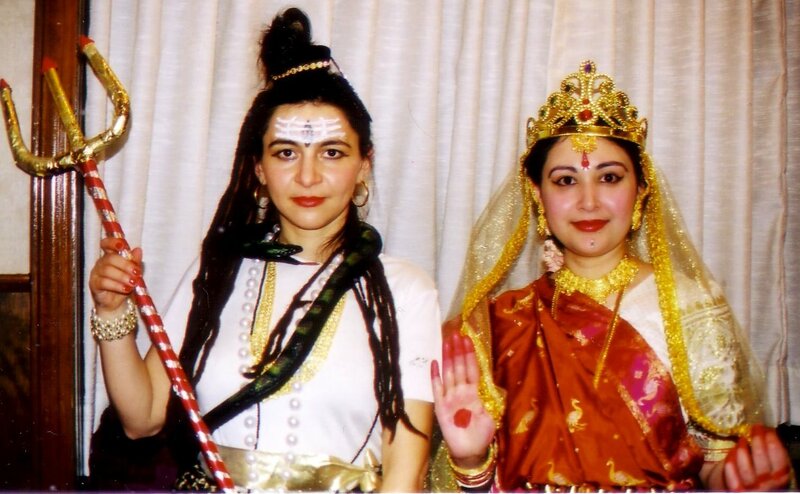 Kathak was performed by Asavari on Mon Oct 15 at 5:30 pm - White Plains Library (White Plains, NY) - India Day. Asavari's 10th Annual Concert on Saturday June 16, 2007 from 3 to 6:45 pmat ... featuring Hindustani Classical Vocal, Sitar, and a dance drama "Shayer Niyaz Ki Mohabbat" based on Kathak was very successful. It is a love story based on Lucknow and Lahore. Photographs and DVDs will be released soon. Asavari's Winter Concertwas held on Saturday, November 18, 2006 in Westchester County. Asavari's Summer Concertwas held on Saturday June 10, '06 at Rockland county, NY at 5 pm was very successful. 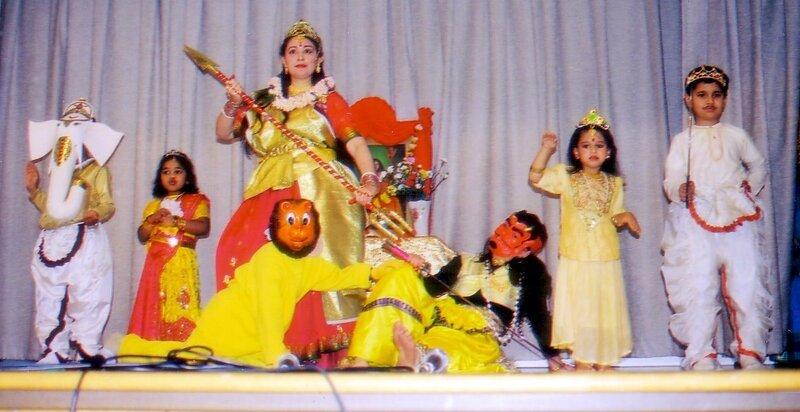 Students and the teachers had performed Vocal, Kathak, Sitar and Tabla. 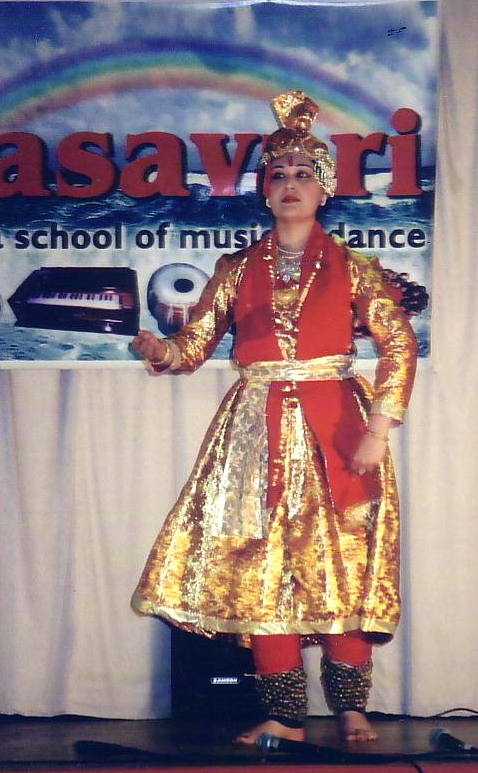 Asavari performed Kathak and Vocal on Sunday Aug 6, '06 (early evening) on behalf of IACAW at the Heritage Fair. 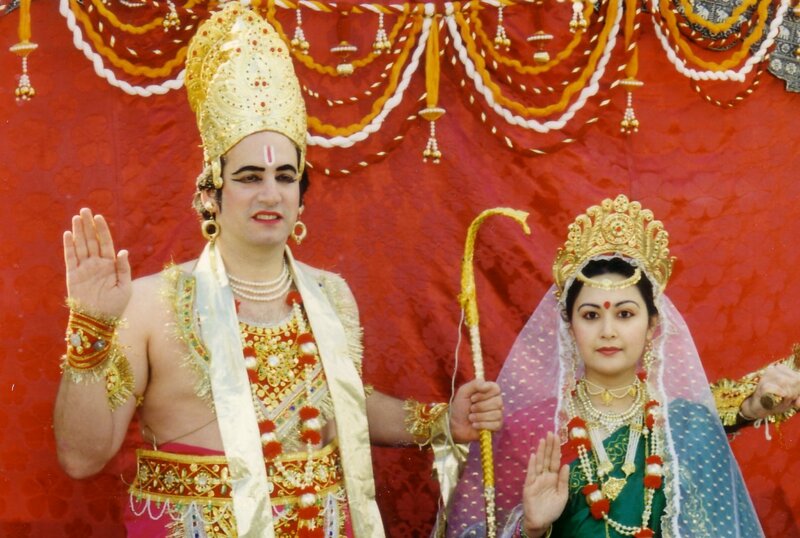 Classical concerts of Vocal, Tabla and Sitar in and around NY for diwali, durga puja 2005...one of our concerts were on behalf of East Coast Durga Puja Association by my gurubhai Shri Shantanu Bhattacharya on Sunday Oct 16 at 8 pm organized by me. 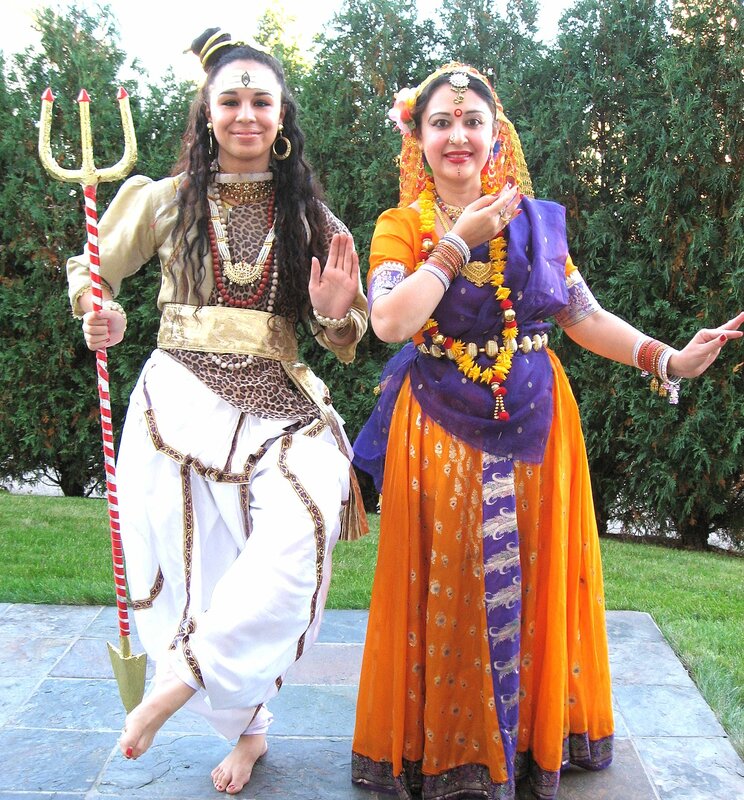 A couple of our students Srishti and Himani had a wonderful Kathak performance at the Ranganatha temple at Pomona, NY on Sunday Nov 6. Asavari students had successfully performed Kathak - a Thumri (raga Khamaj / Teentaal) and a Tarana (raga Kalavati / Teentaal) and Tabla recital at Kensico Dam Plaza, Valhalla, NYon Sunday August 7 organized by IACAW on behalf of India's Independence Day. Our 2005 Annual Concertwas on Saturday May 7 from 3:30 to 6:45 pm. Please click here to see the sequence of the items. It was a very successful one. Thanks to all our friends and the volunteers who had attended the concert. Please view the pictures...DVDs of our annual concert are available now. Kathak demonstration and presentation by Gargi and Naren in tabla on behalf of Westchester Arts Counsil on Saturday December 18, 3 pm at the White Plains Center. 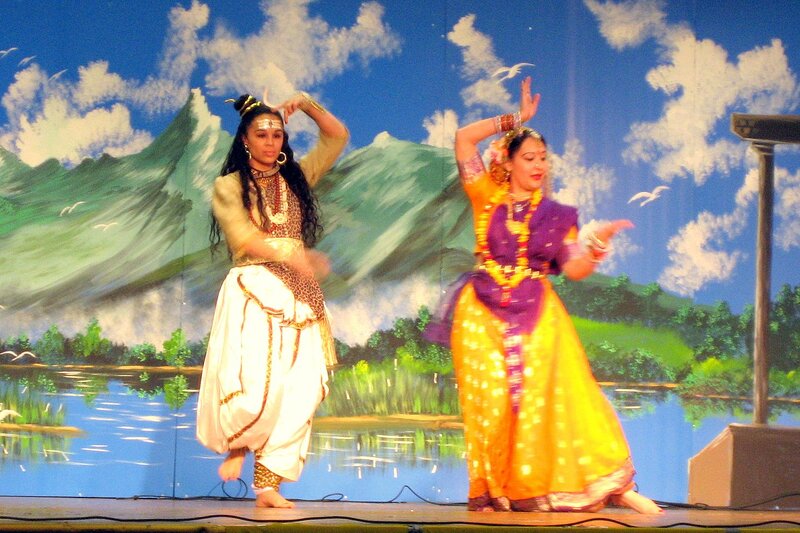 Lucknow and Jaipur style Kathak were presented. 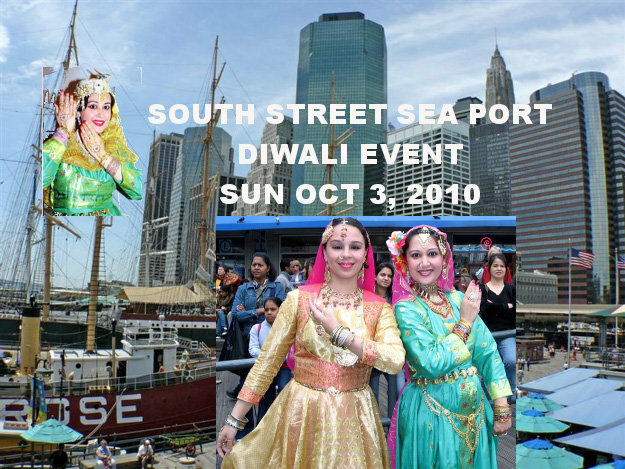 Gargi and group has successfully performed a dance drama at South Street Sea Port, NYC on Sunday October 3 around 3 pm in the event of Diwali organized by AIA. The theme was "United We Win"... on a story written by Gargi; Dialogue composition, poetries and sayerees selection by Gargi Bagchi, Vikas Mathur, Ashish Gohil, Syed Saboor and Bakhtiar Ishtiaq. 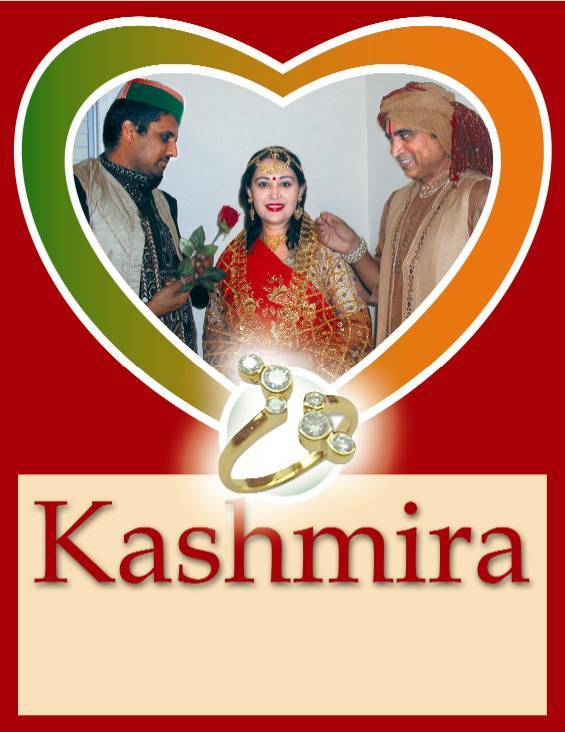 The story is a love triangle of a girl named Kashmira and two men Shivkumar and Azad - who wins Kashmira? Gargi's and her students' Kathak performance on Tuesday August 17 at New Rochelle Public Library (7 pm) was very successful. Gargi and her students' performance in Kathak (Saraswati and Kali Vandana), Patriotic and Folk dances (Jammu & Kashmir, West Bengal) on Sunday August 8 at Kensico on behalf of India's Independence Day, organized by IACAW, was very successful. TV Asia has screened a portion of it. 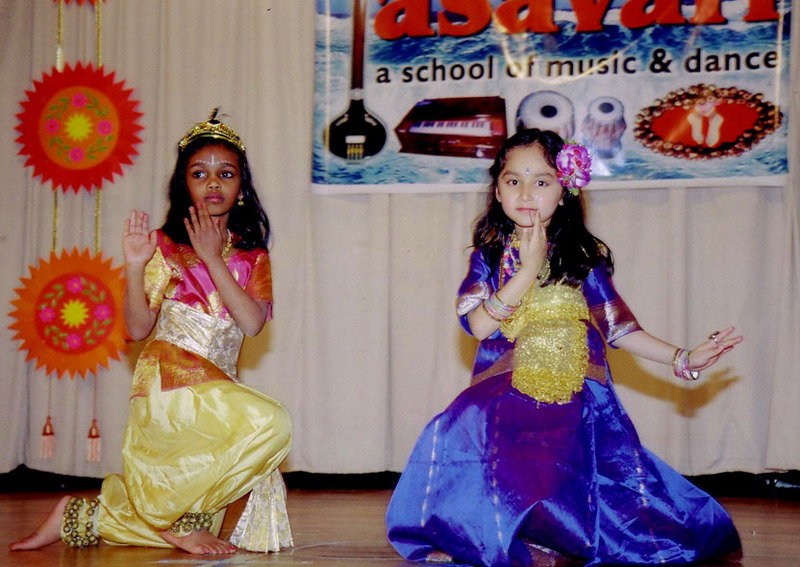 Asavari performred Kathak on May 16 at Dobbs Ferry, NY organized by IACAW. between 6:00 to 10:00 pm, organized by Milan Group. 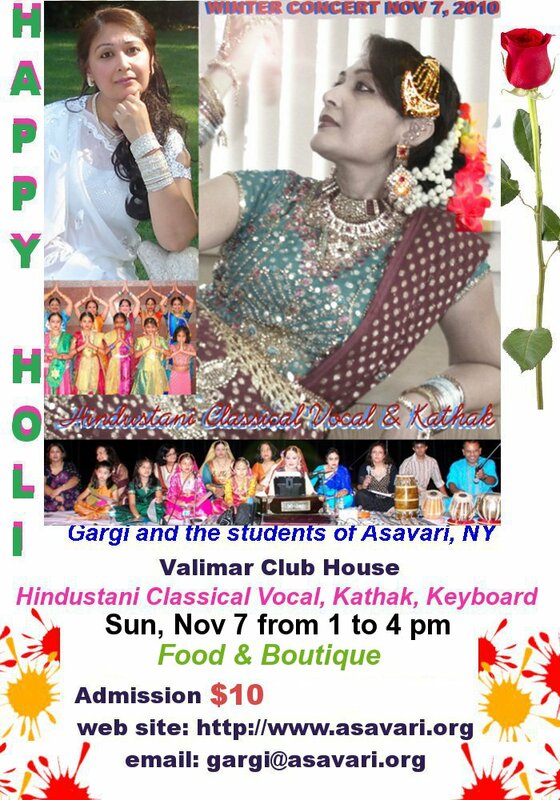 Asavari's 2004 Annual Concert (flier) was on Saturday March 27 from 3:30 to 5:30 pm (Kathak, Hindustani Classical Vocal and Instrumental) at the Ashbury Hall auditorium at 250 Bryant Ave, White Plains, NY. Please click here to see the sequence of the concert. Please contact me if you want to collect a video or a DVD or a CD. Thanks. Please click here to see some pictures. Liberty Science Center (251 Phillip Street Jersey City, NJ 07305) successfully presented a solo concert of Gargi Bagchi on Sunday Oct 19 featuring two Kathak items and a Bengali folk dance between 2 and 4 pm. 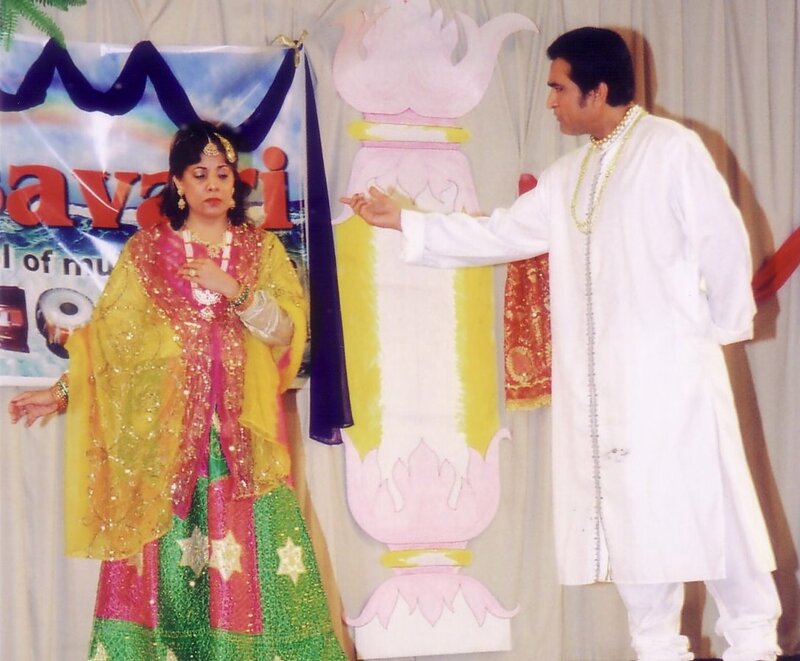 Asavari successfully presented the 'Freedom Movement of India' dance drama at the Deepavali mela at South Street Seaport, NYC (portraying Mahatma Gandhi) on Sunday Oct. 5, 2003 around 3:30 pm. 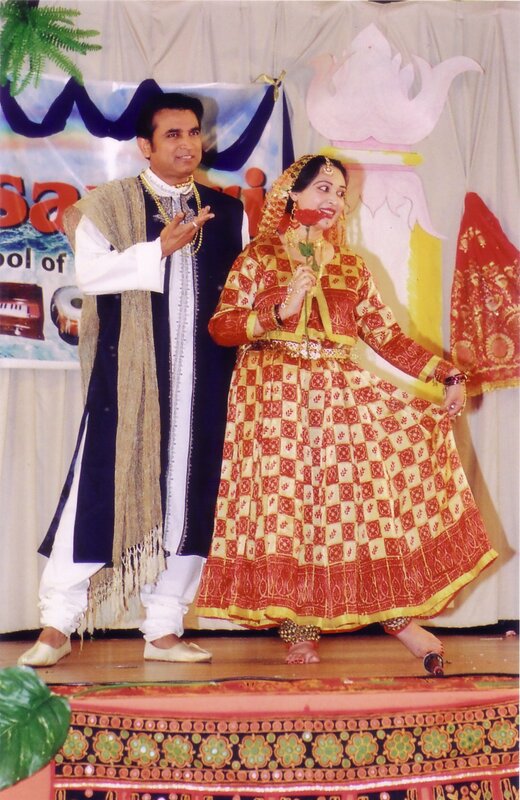 Pictures from Asavari's presentation the 'Freedom Movement of India' dance drama in Kathak (portraying the great characters of Netaji Subhash Chandra Bose, Bhagat Singh, Rajguru and Sukhdev) on Sept 7 (NJ). 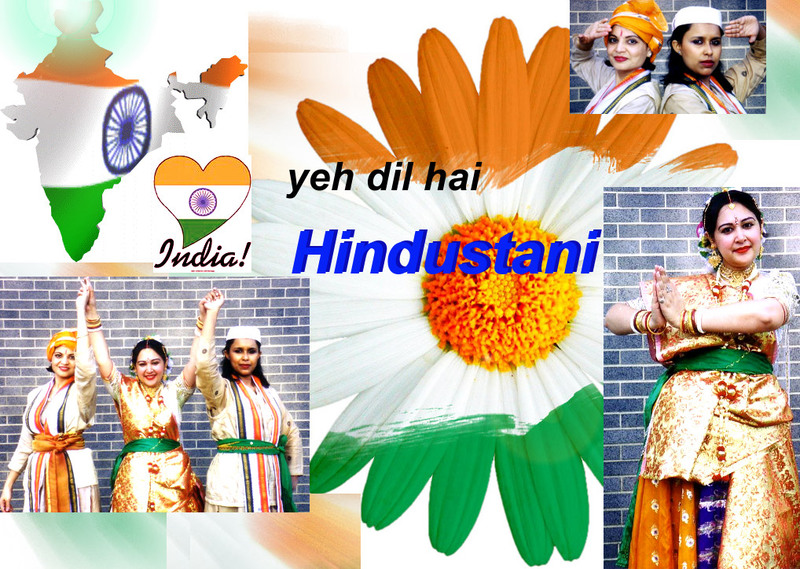 Asavari presented the 'Freedom Movement of India' (Kathak), patriotic songs, classical songs and bhajans (vocal) on Aug 10 (Sunday) '03 at Kensico on behalf of India's Independence Day, organized by Indian American Cultural Association of Westchester. 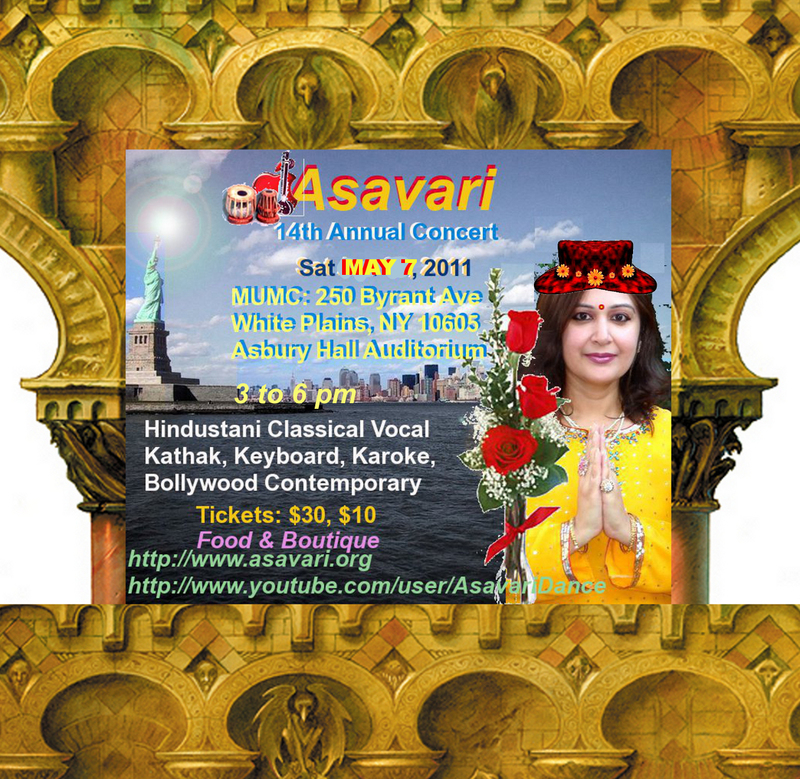 Sat June 21 '03 at 6:00 PM: Asavari presented a classical vocal concert by Pt. Ajoy Chakrabarty at White Plains. Please view details. To view more about the past events, please see the Photo Gallery..